Data Centers used to be rack storage only. A decade ago, you would buy servers yourself, and they would just rent you rack space, guarantee power, cooling and a connection to the Internet. That was it. Over the years, Data Center providers realized they had more expertise and could do a much better (and cheaper) job than their customers, who are only too happy to focus on business. A quiet evolution has shifted their role from providers to partners. The hard stuff—physical hardware, disaster planning, connectivity, backup/recovery strategies, and big data security—are now left in safer hands—that of the Data Center. Ten years ago, the Telehouse brand message was “ON/24/7”. It answered an important question—will my power and connection stay up and running? Now, ON/24/7 is a given in the Data Center world. The IT leader is questioning how to be more efficient—how to shave off costs without sacrificing performance. To be competitive, companies need to ask how can I maximize efficiency, assure security and enhance quality through automation? For these kinds of answers you need experienced consultants. 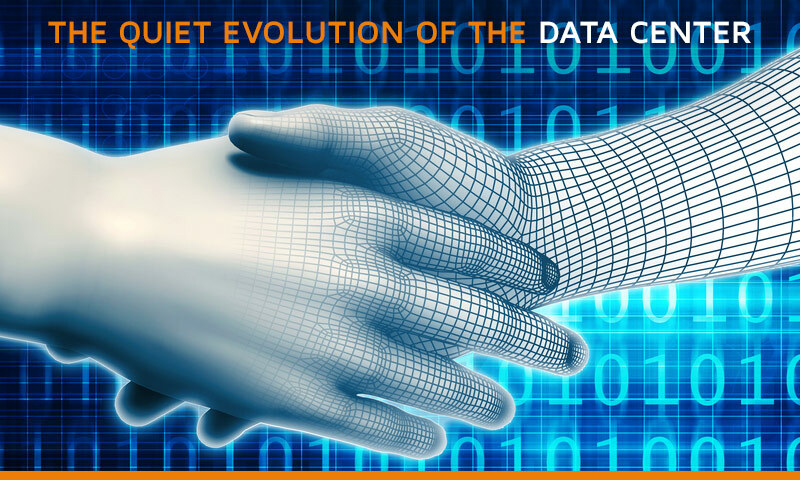 A Data Center team understands business objectives and has evolved into a business partner, not just a provider. Talented people function in tandem with your organization and see your business as more than the people who own servers. Having access to data whenever you need it is still as important as it ever was, but other priorities are pushing the discussion. The IT leader isn’t just the computer guy anymore. He has a much greater role steering business in the digital economy. To make this shift, (s)he needs micro-experts—the people you find in Data Centers—to participate in the planning and design of a company’s Internet strategy as well as handle the hands-on of a dynamic infrastructure. Racks and servers remain the backbone of IT infrastructure, but how space on those servers is purchased is evolving. Statista predicts Data Center workloads will reach 75 percent Cloud-based in 2016. It’s a fine balance between virtual servers and owned servers. Inevitably, operations return to colocation for specific verticals, even after swearing they’d never touch a rack again. Depending on server size, it can save hundreds a month per server to own hardware. By the same token, scalability, fast deployment, and software advances make Cloud devilishly hard to resist. That’s why hybrid is popular, and hyper-convergence is starting to take hold—making as-a-service development much faster. An experienced Data Center partner understands how to get the right mix for your needs and will be an integral part of your planning. Your Data Center and its partner providers oversee cooling and power redundancy, so you’re covered in the event of a blackout, fire or in need of recovery direction in the event of a disaster. They perform regular maintenance upgrades and monitoring to ensure your facilities meet compliance standards. Companies could/should leave all the lower layers, including the physical hardware, the physical security, the disaster planning, the backup/recover strategy, the digital security—everything that runs “beneath” their specific application to the pros. Everything beneath the application could be handled by the Data Center – more efficiently, more professionally, more securely. Your Data Center is so much more than rack space. It’s your managed services. It’s your big data security provider. Enterprise is global as our world gets smaller. Data Centers with a global network offer an advantage to companies who market on multiple continents. The staff can act as an intermediary for you as you navigate new markets and cultures. Wherever a Data Center is established, local engineers and teams can smooth over language barriers and make introductions with local officials and business leaders. They know the pitfalls and legalities in doing business challenging locations like China and Russia and can save you enormous amounts of time with their understanding of the hurdles unique to the markets you’re breaking into. The Data Center can also save your company money and improve performance through access to Peering Exchanges. Peering is huge. It’s part of the reason Netflix has been able to globalize. A bandwidth agreement between partners in Peering exchanges is one of the greatest efficiency measures your company can take. Connectivity through a Peering Exchange is crucial to efficiency, and a Data Center Partner knows how to match your needs with the right Peering partner. In the old days (the really old days), everyone who drove a car fixed their own car. But as cars got more complicated, people still wanted to drive. But they wanted the maintenance done by professionals; people that had the tools, the garage and the expertise to do the job better. I love driving. But I want someone to fix my transmission who has done it before.